In Windows, System files may become corrupted for many reasons. But, This article explains how to repair these missing or faulty system files on Windows. A system file in an operating system is a very important file without which it can’t perform normally. In Windows, You can find the system files in C:\Windows\System32. If any of these files get corrupted or missing, you may encounter many weird problems. Sometimes, Your computer may become unusable for it. But, What is the solution for it? In fact, There is no perfect solution. But, You can follow some widely used methods to handle the situation. Probably, The most widely used method to repair faulty system files is SFC command. If you think your computer is not performing well as core OS components have some problems, it is an ideal way to go. If you don’t know how to use SFC command, follow these tricks. At first, Open the command prompt as administrator. You can simply open the start menu, type cmd, right click on the command prompt and choose Run as Administrator. Now, Type the following command and hit enter. After executing the command, it may take a while to complete the process. You should keep patience until the end. It will save the log file on the desktop as sfclogs.txt. Like SFC tool, DISM also can repair corrupted system files. But, It can do more. The full form of DISM is “Deployment Imaging Service and Management.” To use it, follow these steps. First of all, Open the command prompt as administrator like before. Now, Type DISM /Online /Cleanup-Image /RestoreHealth and hit enter. Then, Wait until Windows finishes the process. After running this command, you should follow the method one again. It may fix your problem. If DISM command doesn’t help, you may restore your system. It may help in some cases. To do it, follow these instructions. At first, Open the start menu, type rstrui and hit enter. It will open the system restore Window. Now, Click on Next. Now, You should see a list of restore points. But, You can tick on “Show more restore points” to get additional points. 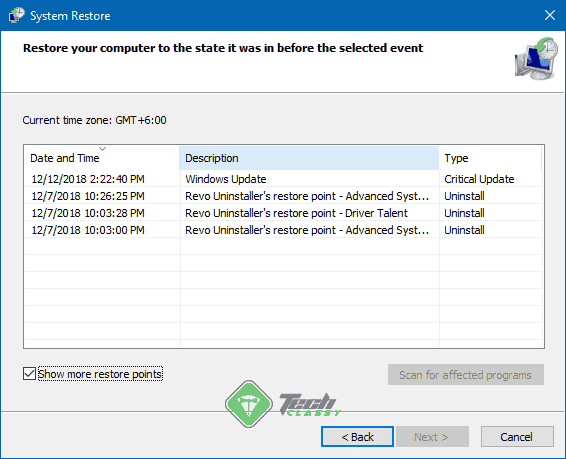 Choose a restore point when your computer performed well without instability issues. Then, Click on Next and Finish. After restoring, All missing or corrupted system files will be fixed. Sometimes, Windows 10 system components become so corrupted that you can’t even use it. Normal tools like command prompt may also become unusable. In that case, You can re-install Windows. There might be many complex methods to resolve it. But, Re-installing windows can be the easiest to go. I hope these tips will help you to repair missing or faulty system files. If you have your own method, you can let us know in the comment box.